How a patterned finish can transform the look of your deck is amazing. With the many options, designs and textures available on the market, the choices prove hard to make. The only option that doesn’t prove difficult is whether the homeowner wants to increase the value of their home. Curb appeal once meant how a house looked from the curb of the street. Nowadays, potential buyers look far beyond the outside, but consider the inside and the backyard in what is a more inclusive look of evaluating a home’s appeal. From brass and copper metallic finishes, to patterned imprints and many other designs, textures and colors, concrete has come to take on a life of its own. In wood decking, there’s an expected abundance of available colors, but the design is what now headlines home and business decking. Aside from the traditional Horizontal decking where the deck boards run parallel to the house, diagonal, herring bone and inlay presently have the most popularity. Understandably, construction of each deck design type calls for a change in construction procedure. Choosing which design accommodates the homeowner’s taste is really a matter of aesthetic choice. A well-designed and maintained deck will always add appeal and value to a home, making it a backyard center piece or one that partners well with a pool or barbecue set up. Entertaining argument about which design is better misses the point behind deck designs – whether concrete, wood or composite. Weather conditions and other factors do have an impact. Despite the newer composites, pressure treated lumber still stands out as the clear winner. The natural woods like redwood and cedar are especially good in colder climates. Even the exotics, in warmer, humid climates, have an advantage. So, before making a design choice, consider the conditions of the region and those special factors that might impact the deck. Conditions impacting the deck include stains, rotting and insect infestation. Once a deck’s surface becomes ready, companies like Pli-Deck offer coating systems with limitless possibilities that will breathe new life into a deck, giving it a touch and feeling that excites its aesthetic appeal. 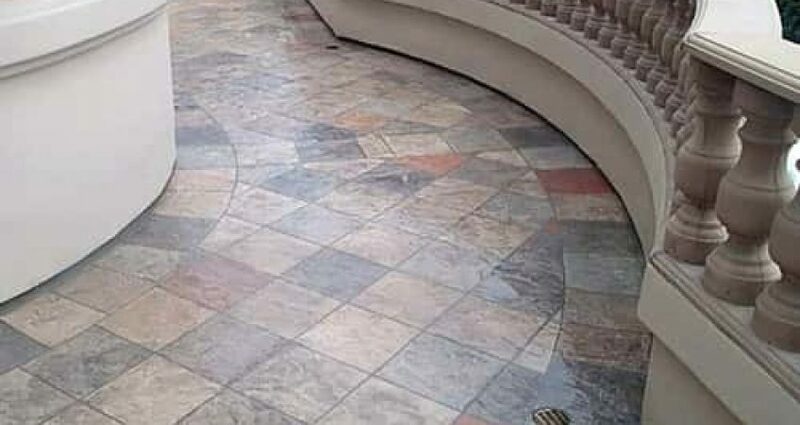 From the typical design alike square tile and flagstone, to the more fashionable like Ashlar Slate and Old English Cobblestone, Pli-deck offers finishes, designs and patterns that prove striking and beautiful. Construction of each design is important to the deck’s longevity as well as its aesthetic appeal, too. That said, maintenance and the proper waterproof coating will always make a difference – not just to appeal and value, but to the homeowner’s pocketbook. Construction techniques have to meet to code standards and incorporate the design feature. For wood, a diagonal deck’s construction varies from a herringbone or horizontal deck. Diagonal decking prevents racking and eliminates the need for installing sway bracing. It’s structurally stronger, but may require that the joist spacing be reduced to 18″. For herringbone and inlays, blocking is essential to maintain a solid surface that won’t move and undermine the design. Including cement, which offers customers nearly as many colors, textures and designs as the woods and the composites — all require waterproofing to prolong their appeal. Choosing the right construction company to build the deck can ultimately prove as valuable as selecting the right coating for the deck. Again, weather and regional conditions should take precedence in the decision. Inlays present as a special treat. They have become the ‘eye-candy’ of the deck world. Often customized to the customer’s taste, they present a special problem. Requiring a lot of vertical blocking in construction, they nonetheless offer an outlet to the most creative expressions. The drawback to value includes over-personalization or becoming a little too extreme. Many examples on the internet or at the local lumberyard or dealer can help define some limits to the creative spirit. After all, appeal links to increased value. With so many colors and designs available, the options are limitless. Contact us, Pli-Dek Systems, for the most up to date information on decks and decking systems that will serve your needs best while providing the best waterproofing coatings to protect your deck’s aesthetic appeal and your home’s value.